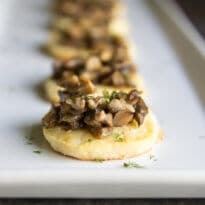 I’ve teamed up with the Wisconsin Milk Marketing Board to bring you these Cream Cheese Crisps with Mushroom Ragout. All opinions are 100% my own. Homemade Cream Cheese Crisps with Mushroom Ragout are creamy, delicious, and deceptively easy! Make the dough ahead, then slice and bake to serve! Mushroom lovers, keep reading. This recipe is a keeper. The base is a soft, puffy cracker with crispy, butter edges. 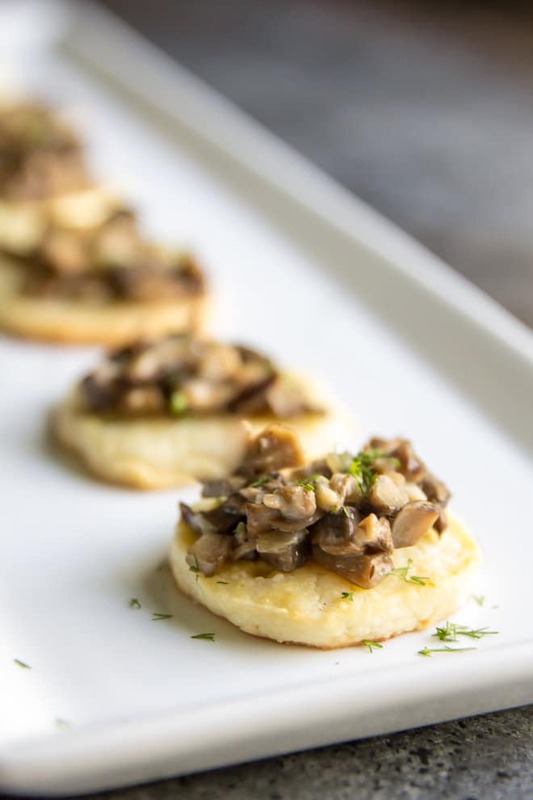 The topping is a variety of wild mushrooms in a warm cream sauce. The results are divine. When it comes to holiday entertaining, I like to do something a little different than the usual suspects. Bacon Wrapped Smokies are for birthday parties. 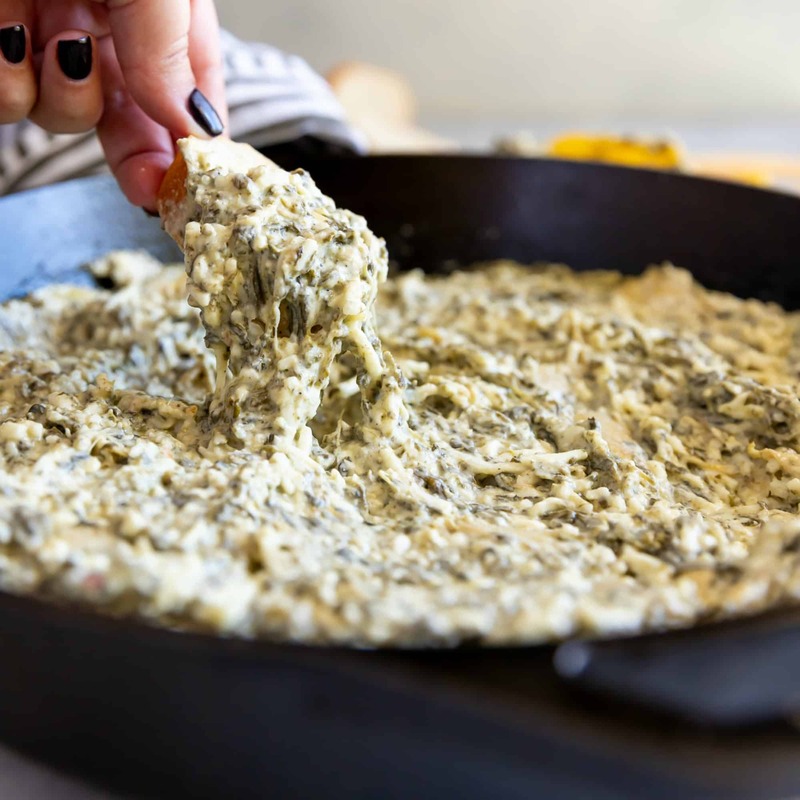 Beer Cheese Dip is for Super Bowl Sunday. Taco Dip is for Friday night. For Friendsgiving, Christmas cocktail parties, and New Year’s Eve, I like to get a little fancier. Or at least appear to get fancier. 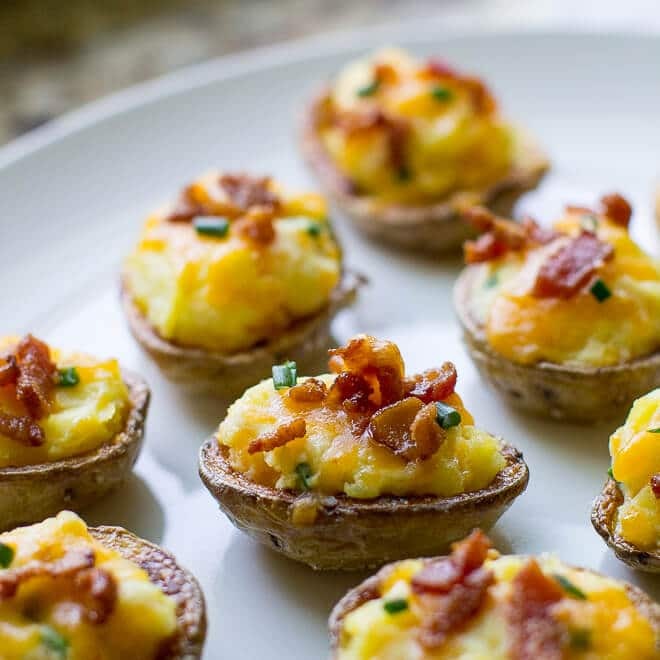 It’s really just about finding an easy way to make a unique appetizer. 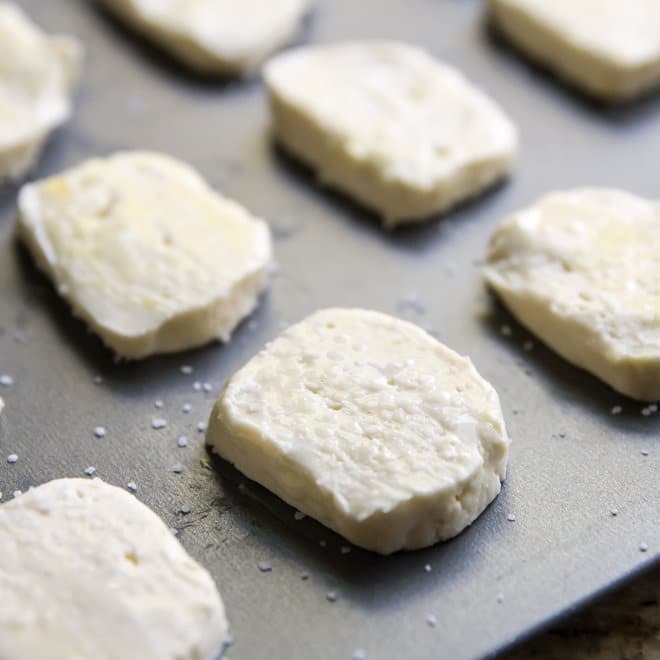 You can make the dough for these Cream Cheese Crisps up to 2 days in advance. They need to chill for at least an hour, anyway. Then, preheat your oven, slice, bake, and serve! 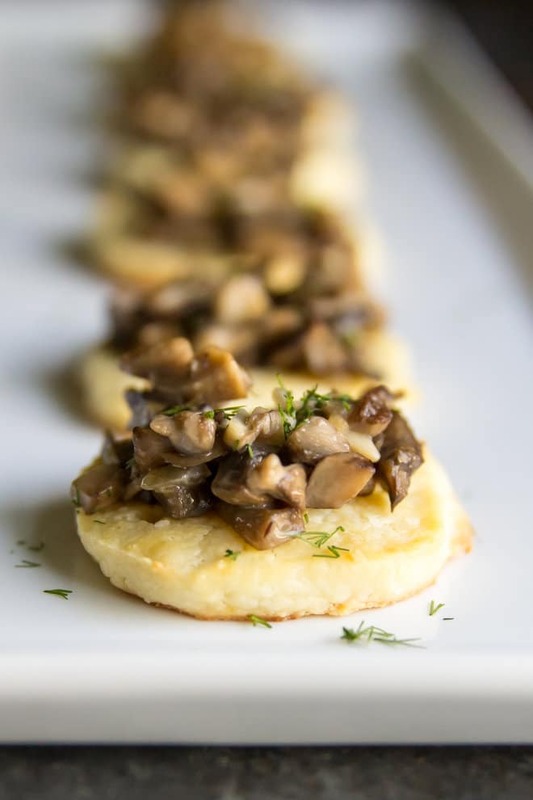 You can also make the mushroom topping in advance and reheat it at serving time (just garnish with some fresh dill!). 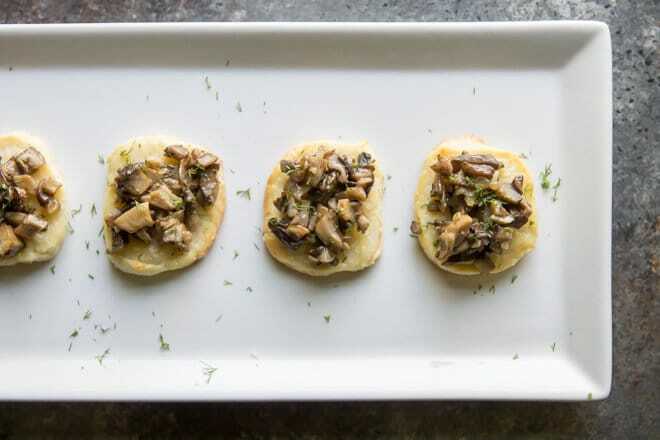 For all the Mushroom Lovers in your life, there is no better gift. I know what I’m putting on my Christmas list! 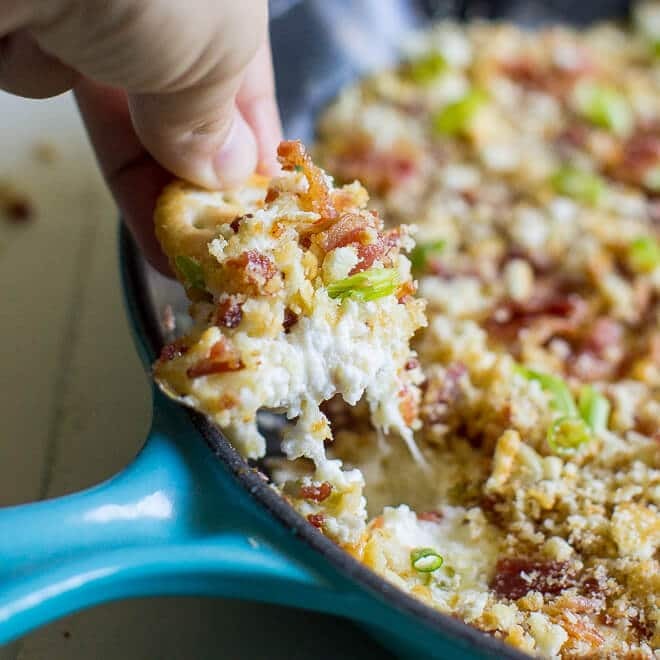 Save these Cream Cheese Crisps to your “Appetizers” Pinterest board! In standing mixer with paddle attachment, or in a large bowl with rubber spatula, blend cream cheese and butter until creamy and smooth. Stir in flour, Parmesan, sour cream, and 1/2 teaspoon salt until well blended. Turn out dough onto a clean surface and shape into a log 12 inches long and 1 1/2 inches wide. Wrap tightly in plastic wrap and chill for at least 1 hour. Meanwhile, heat oil in large skillet over medium-high heat until shimmering. Add shallot and sauté until softened and translucent, about 2 minutes. Stir in mushrooms, 1/2 teaspoon salt and 1/4 teaspoon pepper. Sauté until mushrooms have released most of their liquid and it has begun to evaporate, about 15 minutes. Stir in garlic until fragrant, about 30 seconds. Stir in sherry and 2 tablespoons cream. Cover and keep warm until serving time. To bake crisps, preheat oven to 375 degrees. Remove dough from refrigerator and slice into 1/4-inch rounds, cleaning knife if it becomes sticky. Arrange dough in single layer on ungreased baking sheets. Whisk together egg and remaining tablespoon cream. Brush on crisps. Sprinkle with salt. Bake until lightly golden brown but still soft, about 18 to 20 minutes. The dough may be made up to 2 days in advance and kept in the refrigerator until baking time. Adapted from Williams-Sonoma Hors D'oeuvre. This post contains affiliate links. For more information on my Affiliate and Advertising Policy, please click here. I love this idea! how creative to make a cracker out of the cream cheese! Everything I’ve been making recently has mushrooms in it. I’ll have to do this too! Hi Meggan! The ‘crisps’ part of this recipe sounds really intriguing. 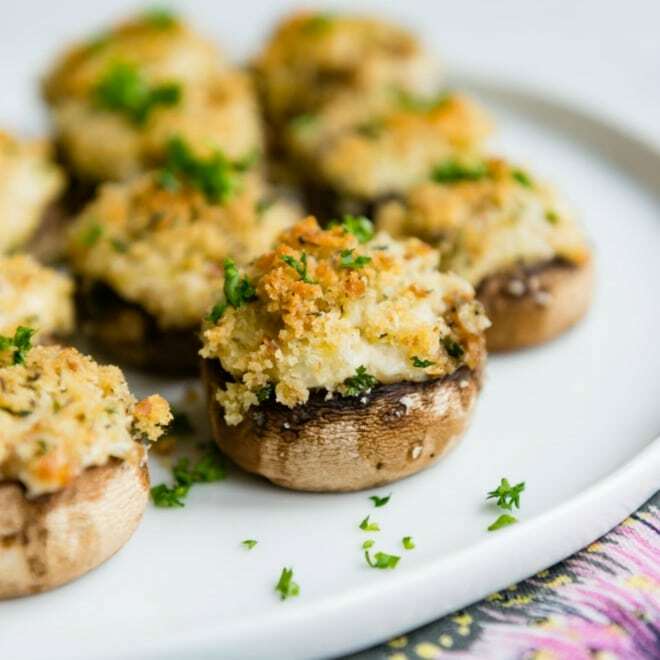 I love that you’ve made an easy appetizer that’s just that little bit different. Definitely one to add to the list ready for the party season! So cool, what a great idea, it really sounds delicious! Also your pictures make me sooo hungry :) I really want to try this one out soon!